We welcome as our newest WSA Member, North Carolina-based American Road Conservation, LLC. 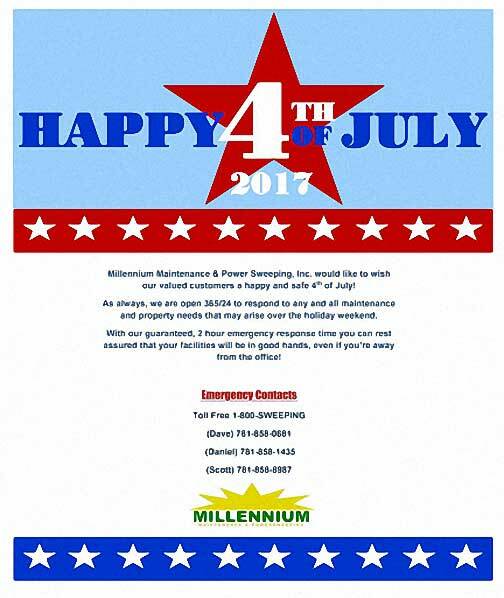 Click on the graphic above to view a brief 4th of July weekend Safety Reminder for everyone from John Meola. Thanks to WSA Member, Jeremy Pitman of EnviroSweep, who wanted to remind other WSA Members there are many Sears and K-Mart store closures in process. He wanted to make sure all WSA Members knew the stores that would be closing in case they were still sweeping them. As may be seen by clicking on the graphic, the stores that are closing were all leased from Seritage. Jeremy received the info complimentarily because he has, in the past, purchased store lists from AggData.com. We’ve been informed that the Facilitysource contract with Academy Sports has been cancelled even though it was scheduled to run through 2019. Anyone know who’s taking it over? If so, please let us know. Dave Ross, of WSA Advisory Board contractor Millennium Maintenance & Power Sweeping, has his team send out notices for all holidays and severe weather alerts. This serves to keep his company in the forefront of customers’ minds when they have any type of exterior maintenance problem. Use this link if you’d like to see what they sent to customers prior to this 4th of July holiday. Bertram Sears, owner of WSA Member Omni Power Clean, has provided a generic Quality Assurance statement/document he’s willing to share with other WSA Members. However, before we do that I’m looking for a couple current Members to review it for additions/changes/ideas, etc. If you’d like to be one of those people, please let us know. We also need three WSA Member volunteers to review the four applications we received for scholarships this year in order to narrow them down to two. Again, if you’d like to be one of those people, please let us know. WSA Members are invited to attend a FREE webinar put on by the American Subcontractors Association entitled: “School of Risk Control Excellence: Employment Practices Liability.” The intent of the webinar is to teach contractors about federal employment law and employment practices liability exposures. The webinar is slated for Tuesday, July 11th from 12pm to 1:30pm, Eastern. Here is the link to get more info and/or to sign up. Note: You will need to set up an ASA account, at no cost, in order to register. Remember that TODAY is the last day to sign up to attend the WSA Sweeper Roundup at a savings of $50/person! Please continue to let us know whenever you have information that might benefit other WSA Members, as well as any ideas you have for how WSA can be of even greater benefit. And, thanks again for teaming up with other power sweeping contractors to make your company more effective and profitable!